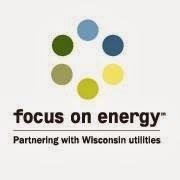 About Focus on Energy Focus on Energy is Wisconsin utilities' statewide energy efficiency and renewable resource program funded by the state's investor-owned energy utilities and participating municipal and electric cooperative utilities. Focus on Energy works with eligible Wisconsin residents and businesses to install cost-effective energy efficiency and renewable energy projects. Focus on Energy information, resources and financial incentives help to implement projects that otherwise would not be completed. Its efforts help Wisconsin residents and businesses manage rising energy costs, promote in-state economic development, protect our environment and control Wisconsin's growing demand for electricity and natural gas. For more information call 800.762.7077 or visit focusonenergy.com. Check out the website - great info on saving energy - rebate plans for energy efficient items!!! That is great. Our electric coop is really working at helping people be more energy efficient, lots of good ideas.